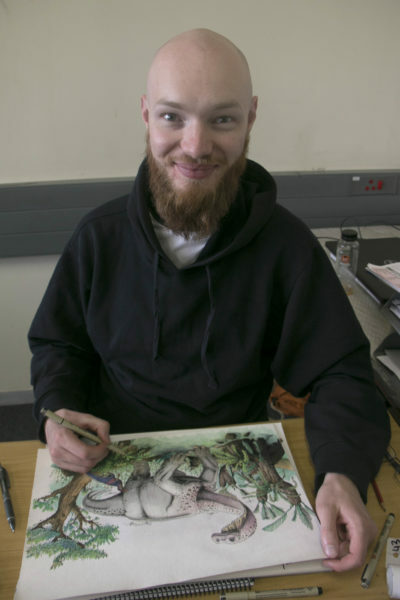 A quick Google search of the newly discovered dinosaur species, Ledumahadi Mafube, will generate results from National Geographic, CNN, and BBC – from the big names to the small, all using the same illustration of the giant creature as drawn by Wits MSc palaeontology student Viktor Radermacher. Radermacher described the feeling as “surreal” after seeing his drawing of Ledumahadi Mafube on National Geographic’s website. He was commissioned to do the drawing of the dinosaur, which is currently the only depiction of what this Jurassic beast looked like. Translated from Sesotho as “a giant thunderclap at dawn”, Ledumahadi Mafube was described by a team of international scientists led by Wits University palaeontology professor Jonah Chioniere in the journal Current Biology last month. Found near Clarens in the Free State, the dinosaur was the largest land animal alive nearly 200 million years ago. It weighed 12 tonnes and was double the size of an african elephant. It is not the biggest dinosaur ever found but it was the first true giant, Radermacher explains. The palaeontologist-turned-paleoartist says he likes to use his imagination within very strict parameters, a preference that lends itself well to scientific illustration based of fossils. Chioniere said that it’s very rare to find someone with scientific training and sufficiently broad knowledge of animals who can also do illustrations such as the one Radermacher drew of Ledumahadi Mafube. Following the reception of the team’s description of Ledumahadi Mafube, Radermacher’s drawing is also going to be used to describe this thunderclap in the board game DinoMight.